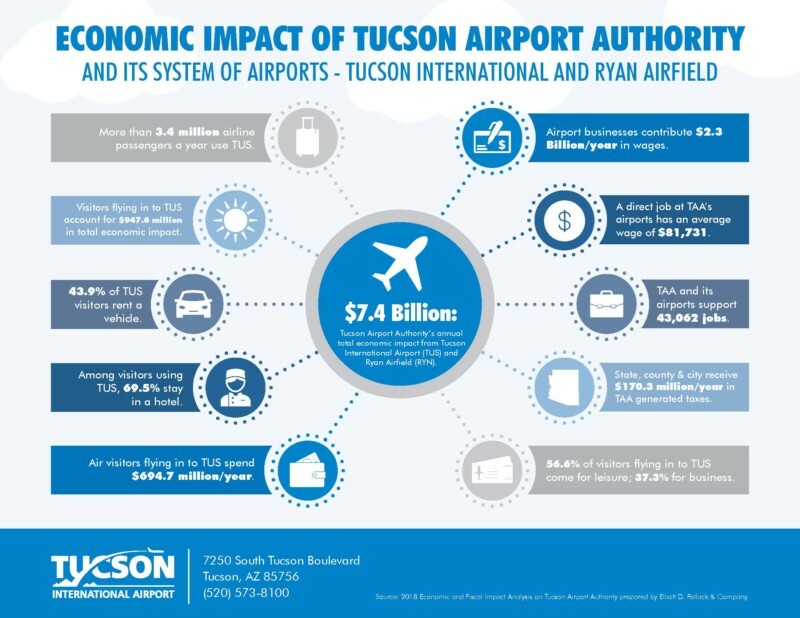 Tucson International Airport (TUS) and Ryan Airfield (RYN) contribute $7.4 billion in annual economic impact to southern Arizona supporting 43,062 jobs paying $2.3 billion in wages. Those figures are part of a new economic study done by Elliott D. Pollack & Company for the Tucson Airport Authority, operator of the two airports. The study, which was presented today to the TAA Board of Directors, shows the important role the airports play in attracting and retaining high quality jobs and industries to the region, according to Jill Welch, Chief Operating Officer and Economist with Elliott D. Pollack and Company. Using new research conducted in 2017 of airport businesses and airline travelers, the study shows the significant economic impact to the region and the fiscal impact to governments. The economic impact of jobs, wages and goods and services directly attributed to employees of the airports and on-site businesses, along with the multiplier effects for indirect jobs created in industries servicing the airports and tenants and induced jobs created by the spending of both direct and indirect employees. A direct job at TAA’s airports has an average annual wage of $81,731 including benefits, well above the average Pima County household median income of $47,000. Additionally, the analysis shows the fiscal impacts the TAA’s airports provide in government revenues through primary taxes paid by businesses and secondary taxes generated by employees of the businesses accounts for $170.3 million a year. Significantly, 51.1% of the 3.4 million airline passengers using TUS last year were visitors to the region. Of those visitors, 56.6% came for leisure purposes and 37.3% for business with the remainder coming for a combination of both. They spent an average of $786 in southern Arizona over a typical 4.8-day stay. That included 69.5% of them paying an average room rate of $133.42 per day and 43.9% renting a car. The study found air visitors spent $694.7 million for the year. The total annual economic impact of tourism (direct, indirect and induced) was $947.6 million. Direct operations of TUS and RYN and its tenants including passenger and cargo airlines, Raytheon Missile Systems, the Arizona Air National Guard 162nd Wing, Bombardier Aerospace, terminal businesses, the TAA and others, created 16,180 jobs with wages and benefits totaling $1.3 billion and an economic impact of $4.5 billion. Spending by visitors arriving at TUS generated an additional 8,774 direct jobs with $241.7 million in wages and benefits. The City of Tucson received $36 million in tax revenues from businesses and employees of TAA, airport tenants and tourist spending, representing 3.7% of the city’s operating expenditures. Pima County received $45.4 million in tax revenues from TAA businesses and employees and tourists spending, representing 3.7% of its operating expenditures. 2018 marks the 70th anniversary for the nonprofit TAA, which is celebrating with several passenger appreciation events throughout the year at TUS. February marked the 20th consecutive month of continued growth in airline passengers at the airport, which is now served by seven airlines flying to 20 nonstop destinations, including its two newest destinations – Austin started in January and Charlotte started in February.